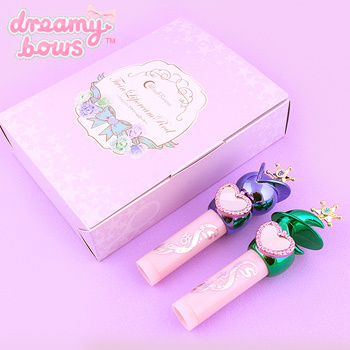 These beautiful, limited edition replicas of Sailor Uranus and Sailor Neptune's lip rods were produced for the Sailor Moon 20th Anniversary. 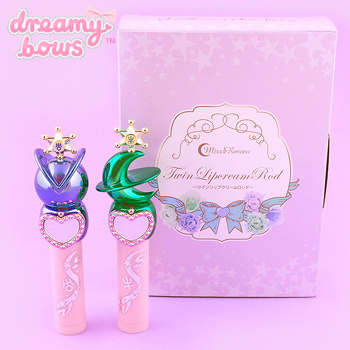 The Miracle Romance Twin Lipcream Rods are lip balms that go on clear when applied, and each has a handy mini mirror. 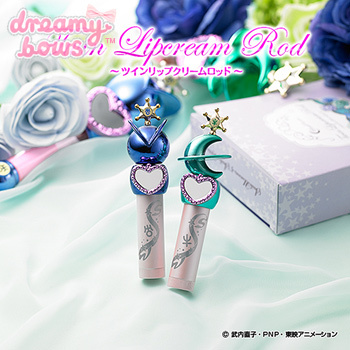 The blue Sailor Uranus lipcream is scented "Planet Mint" (a vibrant, minty aroma) and the green Sailor Neptune lipcream is scented "Mystic Ocean" (a refreshing, marine perfume aroma). Both formulas are infused with shea butter oil, jojoba oil, avocado oil and olive oil, for beautifully moisturised lips.